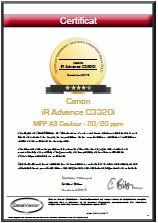 DataMaster has analysed and assessed Canon's iR Advance C3320, C3320i, C3325i and C3330i family of multifunctions. After testing and due consideration, the excellent rating of 4.5 stars out of a maximum of 5 have been awarded to this family of Canon machines. The lab team underlined how very easy to use these machines are. They are extremely quiet, and consume very little electricity. In fact they have the lowest TEC values for any toner machines in their classes. This is due to the very low consumption in stand-by mode. Machines' evaluation certificates and the corresponding rosette badges (as well as those for other machines in the range with the same print engine, plus any rebadged machines sold by other brands) can all be downloaded for FREE from Printer-Benchmark.com. The Radar Chart, the detailed results of productivity tests and other comparison tools are available on the DMO website, accessible by subscription.